Once again, the list is in no particular order, because I have enough trouble narrowing the list down this far already, to say nothing of actually ranking favorites. “He who controls the spice controls the universe!” Frank Herbert’s Dune is, I’m sure, hardly a controversial choice. A science fiction classic of feudalism on a galactic scale, Dune brings the reader into a fictional universe as rich and intense as the spice that fuels it. 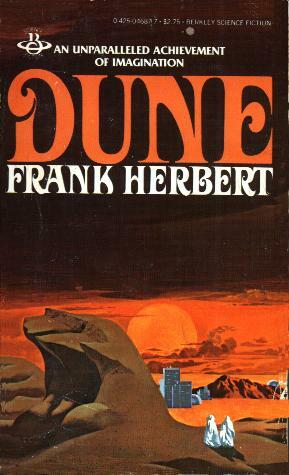 Dune is the first in a saga that, sadly, never reached its conclusion (we shall not speak of those connected to Brian Herbert and Kevin J. Anderson), but it’s also self-contained to the point where it can be enjoyed on its own as well. Politics, war, religion, science—Herbert explores the relationship between them all amid a tapestry of deep and interesting characters. I first read Dune in high school after I saw the long version of David Lynch’s film adaptation. I can recall wondering as I read when those sound weapons from the movie would show up, and in my mind (then and forever) Feyd-Rautha looked like a redheaded Sting. The whole thing is like Game of Thrones, but with sci-fi. And written earlier. With fewer character deaths. And clone after clone of Duncan Idaho. 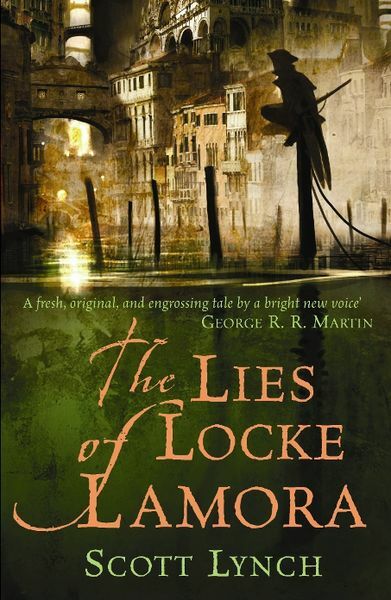 “There’s no freedom quite like the freedom of being constantly underestimated.” Speaking of Game of Thrones, try to imagine the love-child of Game of Thrones and Ocean’s 11, and you’d likely come up with something very similar to Scott Lynch’s The Lies of Locke Lamora. Set in a gritty fantasy world of sprawling cities where the rich live in opulent towers of glass built by a vanished civilization and the poor scrape and scheme in the muck below, this book follows a young thief named (as you might guess) Locke Lamora. Locke and his small band of fellows known as the “Gentleman Bastards” have been groomed from a young age to be the greatest con-artists in history. It doesn’t always work out that way, of course. People die, plans go far, far awry, and trouble spirals out of control when one wild scheme runs afoul of two or three others running in different directions. I only recently discovered this series, which I’m actually glad for because there was a five-year delay between the second book and the third, which came out only recently. (Each book tells a separate tale, but they do follow in sequence in service of a larger arc as well.) I’m on the third one now, and I’m afraid to read it too quickly, because then I’ll have to wait again. Lynch is not afraid to kill people off—in fact I suspect he takes a bit of pleasure in making the reader care about someone he knows he’s going to kill—so I’ve learned to read with a bit of caution. This was the first Gaiman book I’d ever read. It’s also—despite Zeus is Dead having some similarities in tone to Good Omens—my favorite. Having visited London three times myself, stories set in London automatically have a leg up in getting me to enjoy them. (There’s another book set in London further down this list, in fact.) 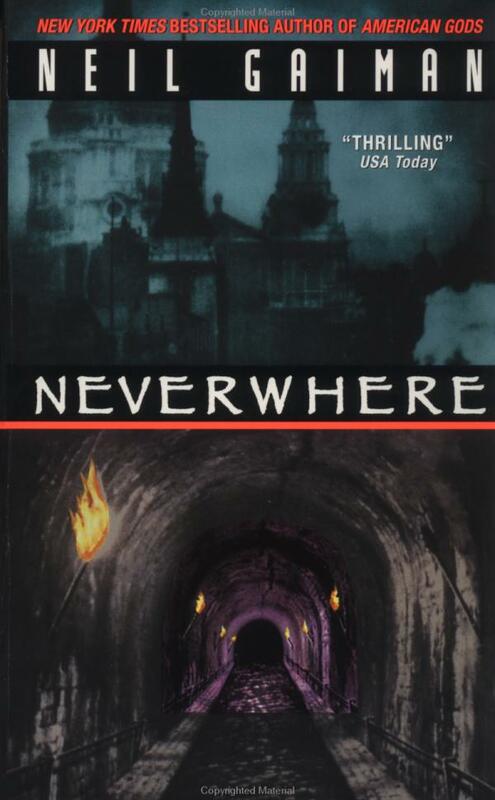 I should have more to say about Neverwhere, but for some reason the words aren’t quite coming. I guess that means it’s time to read it again, huh? 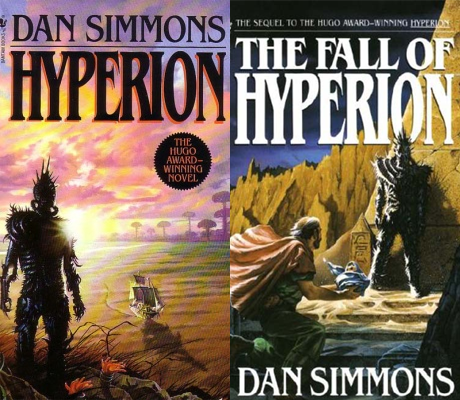 “The world as we know it is ending, my friends, no matter what happens to us.” I had to cheat and combine both the first and second books of Dan Simmons’s Hyperion Cantos into one list item, because while they’re separate books written in different styles, the first just isn’t complete without the other. Both deal with the events surrounding the opening of the “Time Tombs,” mysterious buildings that move backward in time. Both follow a group of seven pilgrims making the final journey there to ask a boon of the four-armed razor-wired monstrosity that guards it. Hyperion (i.e. the first book) is something of a sci-fi Canterbury Tales in the sense that each pilgrim tells their own story as they travel, and the book ends upon their arrival. Fall of Hyperion tells the tale (in a different way) of what happens afterward. Together they’re a masterpiece of science fiction storytelling. “Beware the inveterate punster, Doyle. It’s a sure sign of brewing mental disturbance.” This one’s a potboiler, but it’s also easily one of my favorite books. It’s a supernatural adventure set in Victorian London that imagines that the character of Sherlock Holmes was inspired by a real secret agent of the British Crown. Arthur Conan Doyle is the primary character, thrust into a mystery of what may be supernatural proportions when one of his failed manuscripts seems to incur the ire of a shadowy group in control of undead assassins and the British military. The character who inspired Moriarty is, of course, there as well, and is a far more disturbing creature than Moriarty ever was. The book has a sequel, The 6 Messiahs. 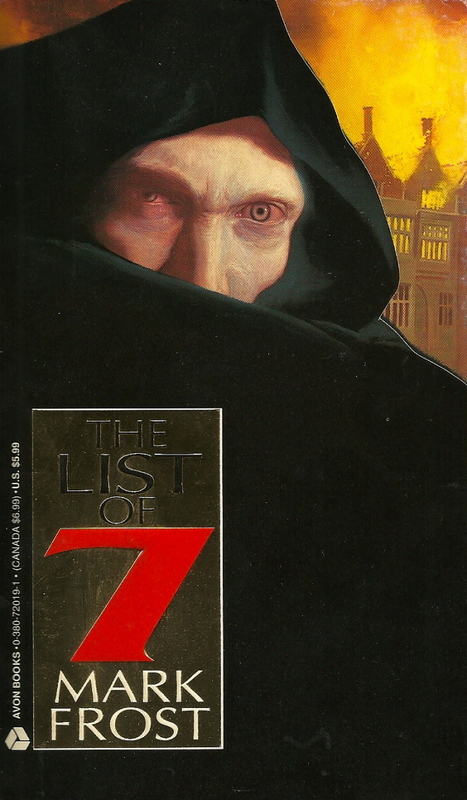 It’s worth a read if you enjoy The List of 7, but it’s not as good. Both of my honorable mentions, while enjoyable books, are likely chosen for sentimental reasons. 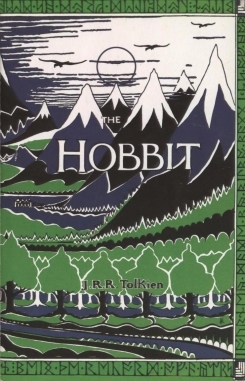 I first read The Hobbit in elementary school, and after all of my other friends had read it. The odd thing is, they all loved it, but none of them suggested that I read it. I heard them talking about Bilbo now and again, but I never got curious enough to ask who he was. Then, when I was in 4th grade in Mr. Miller’s class, we had to split up into groups and make a mural depicting a scene from a book. Our group chose The Hobbit and the scene where Smaug attacks Laketown. One of the guys in the group was an excellent artist (for 4th grade), and drew an awesome Smaug. (My job was drawing arrows and coloring Smaug’s hide, if I remember right. My arrows looked damn good.) The mural made me want to read the book. The copy I checked out from the school library was thick, and intimidating, but I loved it. To this day Smaug remains the dragon by which I measure all other dragons. And I guess I liked Bilbo and Gandalf okay, too. 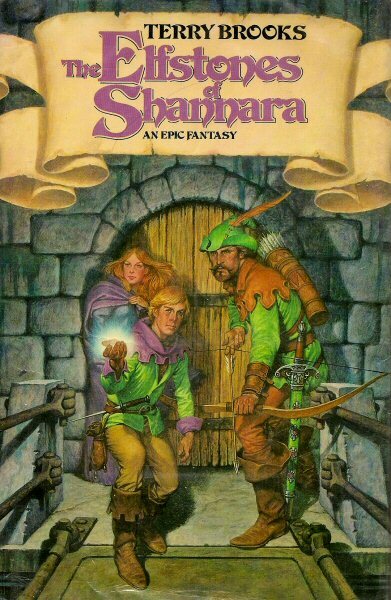 This is probably my favorite of Terry Brooks’s Shannara series (it likely shares the top spot with The Druid of Shannara). Its plot and characters were more original than its predecessor (Brooks’s debut, The Sword of Shannara, whose similarities to The Lord of the Rings were intentionally cultivated by the publisher in an effort to show the industry that the fantasy was a viable commercial genre). More than that, however, this was the book I was reading when I decided that I wanted to be a professional author. I was 18, had just finished my freshman year of college, and I wasn’t having the best summer. Reading was an escape, and while reading this book I realized that I wanted to be able to tell stories that brought as much enjoyment to people as this one did to me. Years later I had the pleasure of attending a novel workshop along with 11 other writers. The workshop was taught by Terry Brooks, who read the opening chapters of our novels along with our synopses and helped us improve them. His advice helped me to improve A Shadow in the Flames and make it what it finally became. I should mention, however, that he didn’t much like the title. Ah well. I saw the movie I Am Legend and was so unimpressed a friend had to practically beg me to read the book. It’s now one of my favorites!! Definitely Dune. The Mistborn trilogy by Brandon Sanderson was extremely good (but it took me to the end to decide this). Probably I’d need Contact on my list (the book has some major differences from the movie that make it better). The Broken God by David Zindell is amazing, but I’m probably biased because their universe is run by an elite class of theoretical mathematicians. I have a nostalgia for the His Dark Materials trilogy from reading those when I was younger. I’m not sure how I’d feel if I reread them now.